Neil Gaiman is perhaps best known for his series of the Sandman graphic novels; twisted and touching tales accompanied by killer artwork. Previous books include Smoke and Mirrorsand Neverwhere, but it is American Gods that found me first. I liked the title, basically, and the blurb intrigued me. Even so, I was unprepared for the story of Shadow, a convicted criminal who spends his time in the joint practicing coin tricks and keeping his head down, biding his time ‘til he’s out and back with his wife, Laura. He’s an unassuming man, sorry for what he’s done and wanting nothing more than to get home and begin work for his friend at a gym. The day before he’s scheduled to be released, he learns that Laura has died in a car accident. The plane ride to her funeral is stormy, turbulent, and Shadow finds himself sitting next to ta man who calls himself Mr. Wednesday. He seems to know all about Shadow, and offers him a job. Doing what, exactly, Shadow’s not too sure, but he accepts, and his journey into the real storm begins. I don’t want to give too much away, in case you’re tempted to give it a read (and you should), but I can tell you that a majority of it is set in Wisconsin, that Gaiman is an exceptional writer who has crafted some of the most interesting characters I’ve ever come across, and that I now know the difference between newly dead, mostly dead and all the way dead. It might look like a daunting prospect at 588 pages in length, but it’s well worth the time to delve; I read the last 200 pages at a straight clip, and wanted more when I turned the last page. 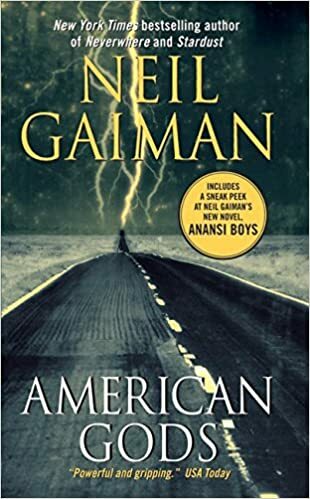 Checking out Gaiman’s website today, I see that he’s just published a companion book, called Anansi Boys. Ah, sweet sequel. The god-wars have just begun.